After two weeks of making flowers and cards and occasionally battling with my first canvas in over six years – WE HAVE LIFT OFF! The first big breakthrough came when I could finally admit I had bitten off more than I could chew and that it actually was okay to walk away from it …….. that took ten days to get to. I had rashly committed to a canvas measuring 600 x 500 mm [23 1/2 x 19 1/2″] – it seemed quite small at the time considering that I routinely painted on 1000 x 800 mm back in the day…. What I was not considering was that I had changed mediums and styles – I used to work with acrylics and the odd bit of charcoal and pen and create giant imaginary land and seascapes – this would be my first canvas as a ‘multi-medium artist’ [Oh, giggle – it makes me so happy to think I might be an ‘artist’…. 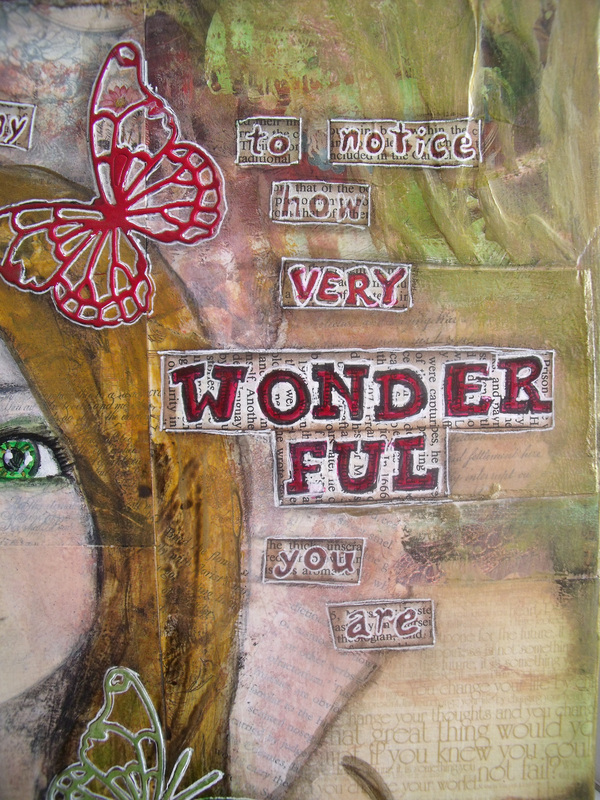 🙂 ] Up until now when mixing my mediums, I had worked in my journal and on card size pieces only. Yesterday I got out a small canvas 300mm sq [11 1/2″] and set about collaging in the background. I used mostly ‘Websters Pages’ and added in some text from old books. I painted over the whole thing with a brayer, removed some colour and added green distress inks around the edges of the torn pages and the edge of the canvas. My confidence grew as I avoided all the idiotic pitfalls I could have fallen into and I didn’t screw up too badly…. So of course I kept at it- adding in Lumiere ‘True Gold’ around the sides of the canvas and pulling it into the front of the canvas as opportunity presented itself. I highlighted raised bits and edges of torn paper too. And if a little is good, more is better – right? 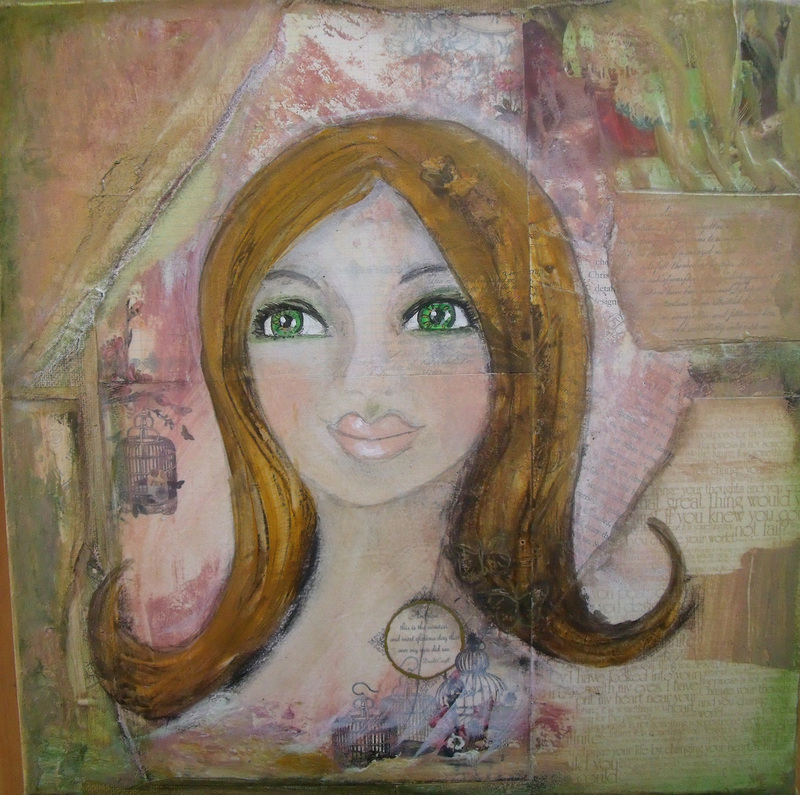 I added gold highlights to her hair so it glimmers in the light – too much? Time to stop – so, of course, I kept going…. I added in the legend for that special someone and then the butterflies. I’ve chopped 2 – 3 cm off the top of the canvas somehow when taking the photo….. but you get the idea. That’s my first Christmas gift made and it is still October – well for another 24 hours anyway ….. onwards and upwards! 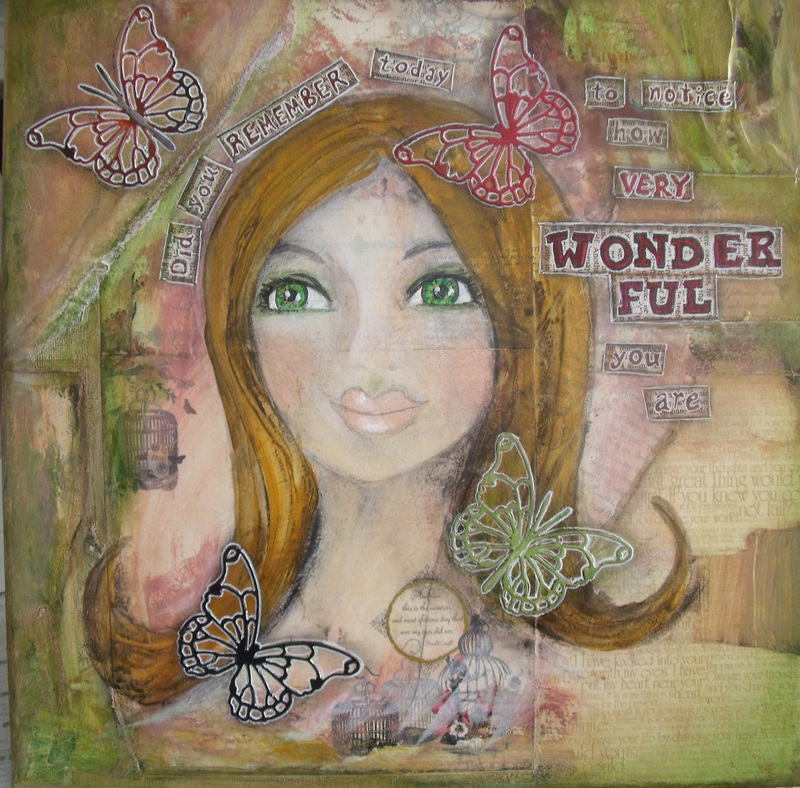 This entry was posted in Creations From My Craft Room, Creativity, Mixed Media and tagged Canvas, Charcoal, Distree Inks, Kelly Rae Roberts, Lumiere 'True Gold', Paint, Taking Flight, Tamara Laporte, Visual Arts, Webster Pages, Willowing by thecontentedcrafter. Bookmark the permalink. Wow this is so beautiful. The painting is gorgeous, and your words are so beautifully inspiring. I missed this in my reader and am so pleased I went back and checked everything, Pauline this is just gorgeous…and I love the words. You are so talented! That was fun! I love her with her soft pink background, lovely green eyes and mischievous smile. I’m impressed that you could pull out a large canvas and get to work like that. You also crack me up. Love your sense of humour. I love that your making gifts like this for Christmas. Your friends surely adore and appreciate you. I am very happy that you enjoyed her creation. 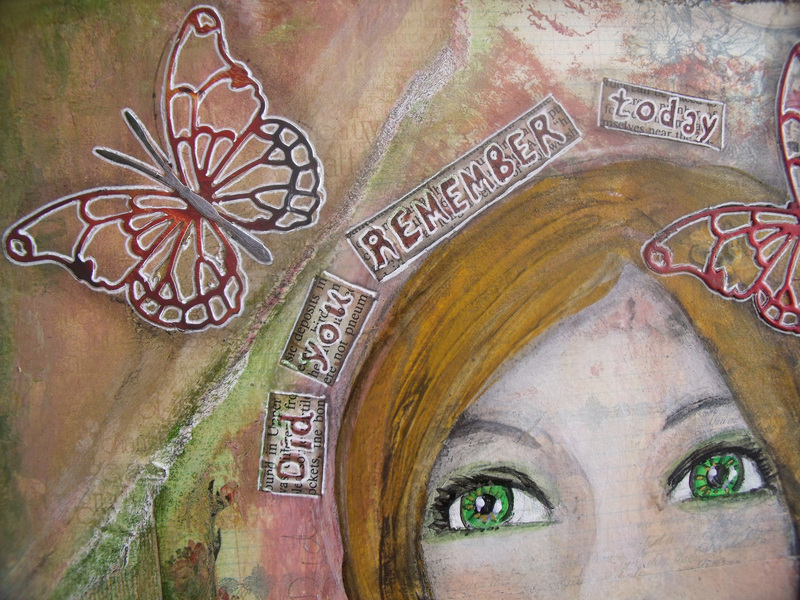 She is for my eldest daughter who sometimes has eyes that colour – depending on the weather and who also is so busy caring for everyone else and thinking she should be doing more – I just want her to look at this thought every day. I hope they know how lucky they are to have you. We enjoy a mutual admiration society in our little family – I am so fortunate to have them! Nice! That makes me smile. She is wonderful! 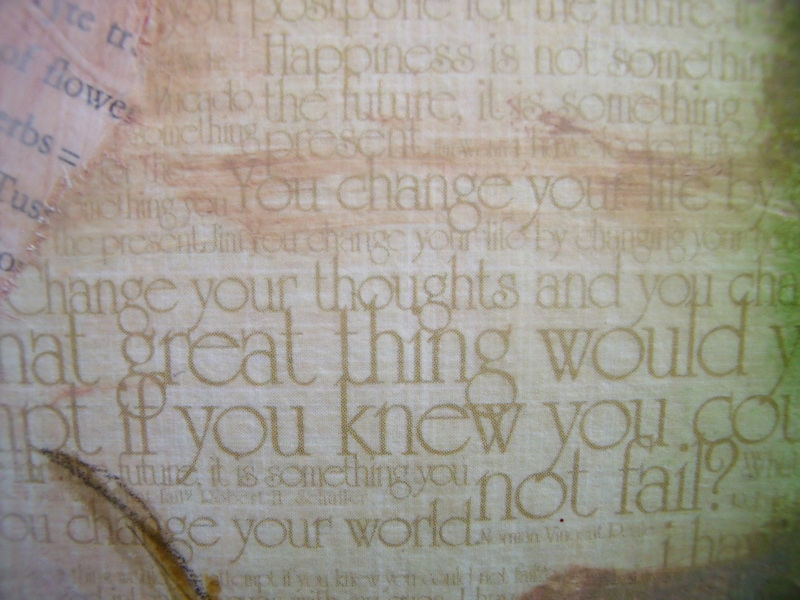 I just love that book from Kelly Rae… So inspiring and I can see you have taken it to heart! Lovely!! Thank you very much Patricia – I like that word ‘encouraging’ very much, it kind of encompasses how I feel about my abilities too 🙂 Happy dance!! As they say across the pond, yet somewhere’s between you and I, “I am gob-smacked” !!! I just adore her Pauline 😀 You definitely ARE an artist and I so love your style. 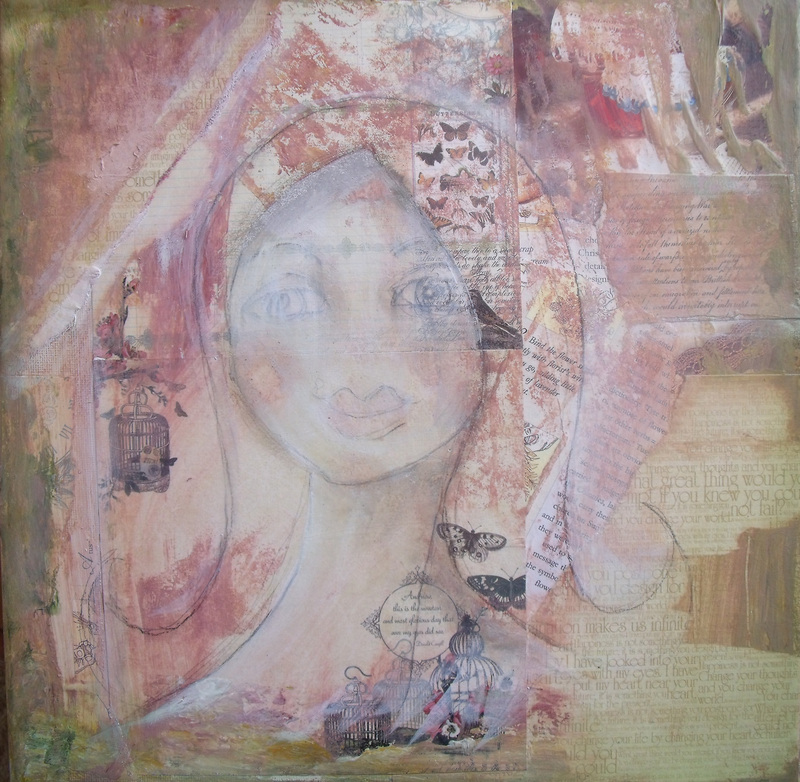 I always wondered what came first, the process of making these mixed media works. Thank you for walking us thru and in such a funny way. I laughed out loud at, ‘time to stop…so naturally I kept going’…bahhaa, I’ve been there too 😀 Her eyes are so sparkly and such a pretty colour. The lucky recipient will be over the moon. How can you wait for Christmas to give it? Might you consider an Etsy shop? Now who is giving who a big head?? I am so glad you like her – it’s the first painting I have done in years that I am happy with 🙂 It’s for my ED for Christmas [shhh] her eyes are that colour sometimes – just beautiful! It’s funny you should say that – I am thinking about an Etsy shop ……. not sure yet….. must do more research….